The Open Graph protocol enables any web page to become a rich object in a social graph. For instance, this protocol is used on Facebook to allow any web page to have the same functionality as any other object on Facebook. Using the protocol allows you to add images and text to the URLs of your site when you post them on Facebook, Twitter and any other social media that reads this data. You don't have an embed code for Open Graph - you only need to configure it in the backend and the plugin will add all the necessary data in the page header. Some of the data, like the Meta Title and Meta Description for the site or the Joomla articles, are loaded automatically (so do not forget to fill them in), other data, like the image and the video are selected by you. 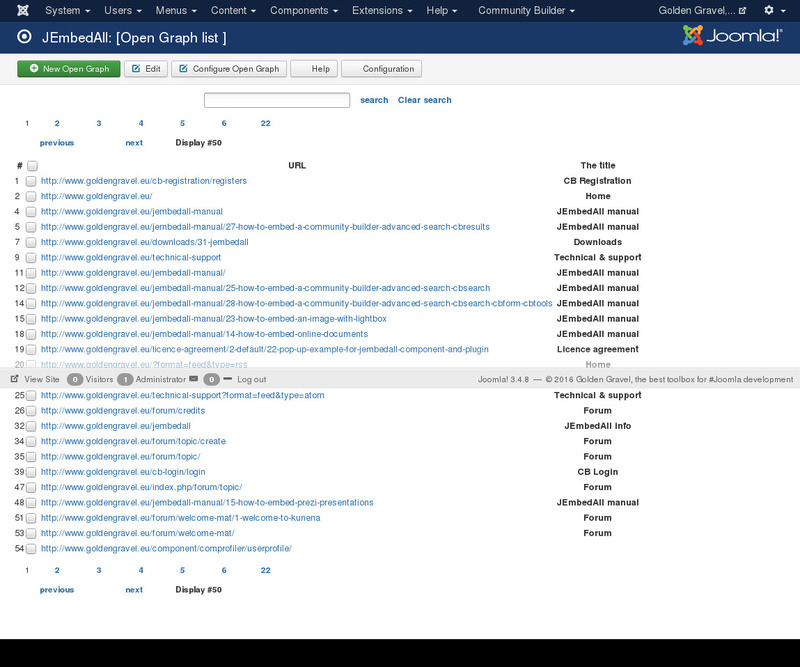 To start configuring this you have to go to Configuration section and select Configure Open Graph. 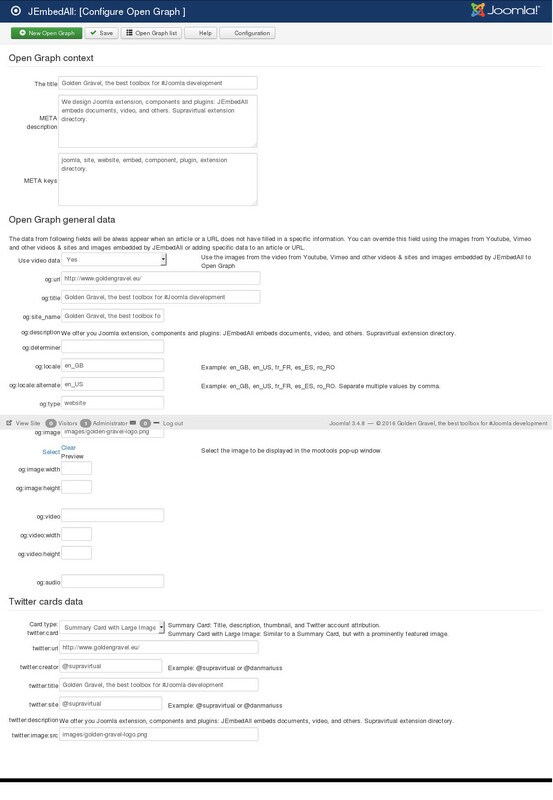 The first page contains the form for configuring the Open Graph general data and the Twitter cards data for the entire site. when you define some Open Graph data for a specific URL (selected from the Open Graph list as the image below) or a Joomla article. These Open Graph data also overwrite the YouTube / Vimeo / Lightbox image. The list from the third image was populated automatically when the pages in your website are loaded by the browsers or bots. Selecting any one of these URLs and hitting the button Edit will load the form from the fourth image where you can set the specific Open Graph data for each URL. You can also access the form by hitting the button New Open Graph - you will have to select an article in order to set the data. The connection between the URL and the article is done by the script. How to configure Open Graph protocol into your Joomla site - Golden Gravel, the best toolbox for #Joomla development: 5.0 out of 5 based on 1 reviews.